Cape Town – The hit show Peaky Blinders returns for a third season on BBC First (DStv 119). Thomas Shelby (Cillian Murphy) is drawn into a maze of global intrigue in the electrifying new season of Steven Knight’s acclaimed family saga. His legal and illegal businesses have made him rich beyond his dreams. He now inhabits a Roaring Twenties world of beautiful people and sumptuous mansions, and he has found love at last. But Tommy’s relatives have become increasingly difficult to handle, and threaten to blow the Shelby family apart. 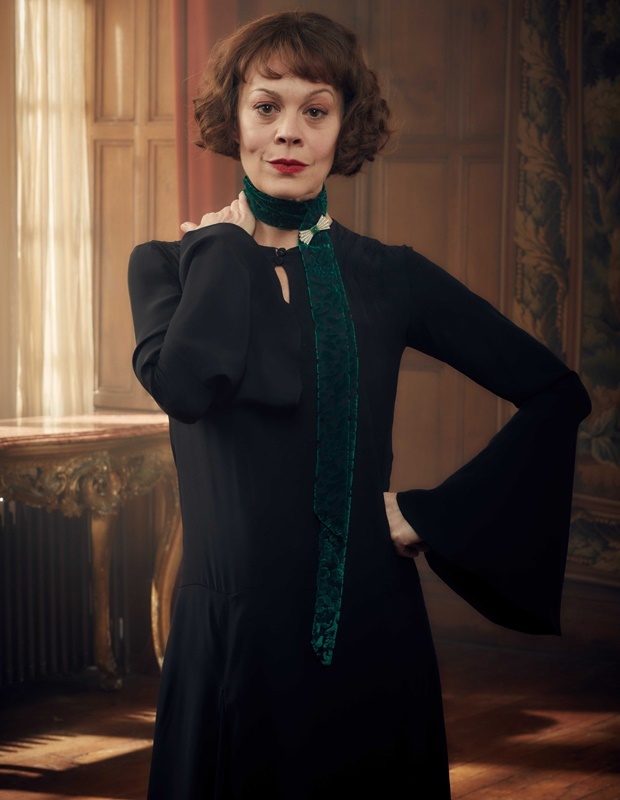 Aunt Polly (Helen McCrory) is Tommy’s second-in-command, the person he most trusts with the secrets and ambitions of the family business. But the return of her son Michael to the fold has made Polly uneasy about the company’s illegal enterprises. When she befriends a member of the upper classes, Polly imagines different possibilities for her future, and begins to ask herself questions that could strike at the very heart of the Peaky Blinders. McCrory sat down for a quick Q&A about her character and what to expect in the new season. Where did we leave off with Polly in series two and how do we find her in series three? We left Polly in series two having been reunited with the son that had been taken from her when he was young. She understandably feels hugely guilty about her past and wants to defend him with everything she has. Campbell, played by Sam Neill, sees this weakness in her and uses it to humiliate her, compromising herself in order to save her son. Polly is further humiliated by the fact that her son and everyone else knows what she has done and so she does what Peaky Blinders do and she kills Campbell. How does Polly reconcile her actions in series two with her conscience? At the beginning of the third series you find a woman that, as a Catholic, is damned as a murderer. This series explores what happens to Polly’s soul and her mind as she carries the knowledge that she has killed a man. It is interest to see how she battles with her conscience while still being part of this world that continues to be involved in killing. How did you feel when you read these series three scripts and what Steven had in store for Polly? My first reaction on reading this series is that it is the best Steven has written. The Peaky Blinders have expanded. They’ve got more money and therefore they have moved into the upper echelons of British society. It is a fantastic opportunity for Steven to write about how the working classes rubbed shoulders with the aristocracy of the country. This is post First World War and the whole fabric of Britain was being challenged. Within the first fifteen minutes of this series we see both sides of this coming face to face with the tension that was rife in Britain at that time. We also explore what happens when you make that kind of money, you move up in the world but everyone knows where you are from and nobody will let you forget it, that’s the tension that kicks off the series. The Peaky Blinders have moved into a different location and a different world but you have people that cannot escape their background, or can they? That’s the questions Steven poses. How would you describe Polly’s position in the family? Polly is the matriarch of the family and she’s the treasurer of the Shelby Company, which I think it important. She is the one that oversees all the accounts so she knows everything that is going on, every deal. She watches the family and can see who is coping in this new world and who is not. It starts to splinter the family and the situation becomes very much sink or swim, with Polly definitely swimming. Right from the beginning Polly tries to work out how she is going to assimilate herself within this new world and how she is going to succeed and take the entire family along with her. Polly becomes much more focused on the family’s success in this series. Describe the complex relationship between Polly and her son, Michael? I think as soon as Polly is reunited with Michael she sees him as the natural successor to Tommy, and nurtures him as such. However, Polly is adamant that Michael is not to become involved in the murkier side of the Peaky Blinders dealings. The tension arises when it becomes clear that Michael has very different ideas. Polly is definitely the woman behind the son and she pushed him forward constantly. She is very protective of him and is the original Birmingham tiger mum of the 1920s. The family business aside, what is Polly’s view of Tommy? It’s hard to separate family from business because Tommy and Polly think the two are intertwined. Polly feels that Tommy runs the business very well and gets frustrated if she sees him take any steps towards the illegal or gangster related crime. She wants to make sure the family’s hands are clean. Tommy is the person that she is most honest with and there is a real sense of them working the future out together in this series. Campbell robbed Polly of her femininity and independence during series two. How has she rebuilt herself? Campbell does indeed strip Polly of her femininity and independence in the last series and you feel that when you meet her in this series, she feels damned. She is closed up and doesn’t want to talk about her actions. She has built a wall around her. As series three progresses Polly tries to move forward from her horrendous experience. Polly is the driving force behind the women going out on strike. Is this an early indication of where we see the character of Polly heading? The women of the show and Polly’s position is interesting as although they have positions of power within the company, they do not have the same freedom or rewards as the men have. Polly does go out on strike with the other women and goes on the march to see what the feminists of that time are discussing. I think that the characters in this drama would have felt an inequality when it came to the business side of things. Polly does adopt masculine traits in order to communicate with the men so that is the way she copes with being a woman in a man’s world. She was one of those women of that time – strong and intelligent because she had to be in order to survive. Describe how Polly’s style has evolved over the years? There is a huge shift from the last series to this series in the way that we are all styled and dressed. The biggest change for Polly is that they cut all my hair and I was really nervous about that. The shapes of the costumes have changed dramatically as you lose the waist in the 1920s. I think that the audience will accept the change as they do with other long running series where the style changes across a time period. Peaky Blinders has a strong fan following. Have you ever been surprised that you are recognised for your work in this particular show? I was genuinely surprised that Peaky Blinders was so popular in America. I went over to New York for the summer and people were complimenting my work. I assumed that it was in relation to another series I’d recently finished that had aired in the US. After a while someone mentioned they had to watch it with subtitles, which is when I realised it was Peaky they were talking about. I’ve also had fellow actors and producers and directs say that they are really big fans, which is so pleasing as everyone works very hard on the series to try and make something original and fresh. Has there been a particular scene you have enjoyed filming or location that you have enjoyed filming in? We filmed in a place called Arley Hall; a beautiful house that we open the series on at Tommy’s wedding. Steven wrote these amazing scenes where you have one side of the church congregation all suited and booted and then the other side the gypsy families of the Peaky Blinders facing them for the service. There are some really tense scenes between the two families. Steven wrote this series beginning with the shortest day of the year, in the heart of winter, and finishes the series in the summer, on the longest day of the year. What do you think attracts people to the series and keeps them wanting more? We are used to British television exploring the upper echelons of society but not so used to watching it explore the below stairs as much, and the Peaky Blinders are not even that; they are the below, below stairs. In fact they’re underground really. I think it’s interesting to see how people simply struggled to live in Britain at that time. If they were born now Tommy and Polly wouldn’t be the criminals they are in the 1920s because they have the brains to get out. It’s compelling to watch people that have the passion to try and improve their situation, however bleak that might be. Despite the awful things the Peaky Blinder get up to, you realise that there are few alternative open to them. They pick themselves up and starts again so I think that the energy these character have, dragging themselves up from the gutter of Birmingham is something we haven’t seen before. Catch Peaky Blinders Wednesdays at 20:00 on BBC First (DStv 119).